This is something I posted on the Facebook group The Enterprise Shed back in August. It’s initially written for the ‘shedders’ who took part in the Enterprise Shed: Making Ideas Happen MOOC, created by Newcastle University, which is why it talks about ideas so much. The original Facebook post is here. It occurred to me this morning that augmented reality allows you to see and interact with things that are not there. This came about because I was looking out the window and saw the moon, low in the sky, lit by reflected sunlight. What I also saw though was ‘floaters’ and other artefacts of eyesight, as well as telegraph poles and some windows in need of a clean! I realised then that there was the reality of the moon, and the ‘added’ reality of the floaters, a squashed bug and some mucky windows – initially I had ‘seen through and past’ the windows to see the moon, but refocusing brought the windows and my own eyes into this expanded reality. Simulate what someone is seeing with various vision ailments; colour blindness, astigmatism, macular degeneration, short and long sight etc. This would be very helpful to health care professionals in appreciating what people with those conditions go through. Ok, so a lot of these are technology based, and you may be wondering where you might be able to fit in. I look at it this way; huge corporations are putting enormous amounts of money into getting the technology sorted out, and pretty soon is going to happen, and it’s going to be available for very little (that’s what technology does). The use cases I came up with are quite literally the tip of a very large iceberg-you can do the same, in your own areas of expertise or enjoyment (you’ll see I’ve completely missed the arts-please fill in the gaps! 🙂 Much smarter people than me are convinced that this field (things that are not there) is enormous and very sparsely populated at the moment. Any technologist that tells you explicitly how a technology is going to be used is probably wrong (I guess that includes me! ), and your ideas and thoughts are just as valuable. James had a great guest on his podcast today, Derek Sivers. His backstory is that he wanted to sell some of his records online at a time when it wasn’t possible to do that, sometime in the late 90’s and so he learnt programming and built his own site. He then took on some friends who wanted to sell their records through his site, and then friends of friends asked and before he knew it, he had a business called CD Baby, which he eventually sold. He has some sage advice: “Bluntly put, you shouldn’t start a business unless people are asking you to.”. It’s a longer podcast than normal (about 1hr 24m) but well worth it – he’s got so much good advice and he and James are clearly having a great time. Derek’s site, and don’t miss the selection of books he’s provided summaries of. Derek’s book is on Amazon:Anything you want: 40 lessons for a new type of entrepreneur (I’ve got the 1hr 31 minute audiobook and have listened to it over a dozen times – it’s exceptionally good). There’s a lot of good advice in there for people who took part in the Enterprise Shed MOOC a few weeks back. This week on the Enterprise Shed: Making Ideas Happen MOOC we moved into another gear; we’re looking at where ideas and insights come from, whether they can they be made, and what inspires people and where people might go to find inspiration. After the introductions of last week, there was a lot of communication back and forth between learners; offering advice, sharing experiences, pointing out nuances others may have missed in their own idea and a lot more – which was great to see. Later in the week, learners shared their problems with each other and provided feedback to each other, and this went down pretty well too. There was a lively thread in the “Where do your ideas come from?” step, where someone said they hadn’t come up with an idea, so I suggested making a list of ten ideas based on ‘cheaper food in the supermarket’ (I think I’d been grumpy about the price of bananas at the time). I started it off, then someone else came up with a neat idea around packaging. I added another nine and challenged them to come up with nine more, which they did :). We were on a roll now, and I picked up on one of the nine ideas around making ‘old lady shopping trolleys trendy again’, which then lead to someone else suggesting that what was really needed was a ‘cute mobile grocery truck’ which played music as it traveled around. This then lead to a discussion about ice cream vans (which was the original inspiration for the truck, mainly because the music got you excited before you even saw the ice cream van) which lead to the truck selling other things such as coffee, pastries and donuts… This idea obviously and inevitably led to the idea of a musical Guinness van in Ireland. Now whether Dublin city council would be happy with a Guinness van meandering through the streets selling Guinness or not isn’t really the point, the point is that by starting with a simple thought ‘cheaper food in the supermarket’, we collectively went through almost thirty ideas and came up with something completely different. We could have picked any other idea than the ‘old lady trolley’ and ended up in a very different place. 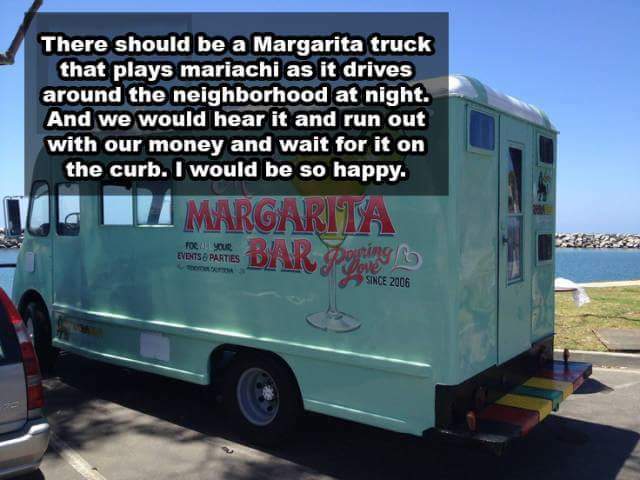 It finally finished with us noticing that someone had thought of the truck idea, but for selling margaritas instead. It is usually easier to come up with ten ideas than it is one – if you only have one idea, it had better be a great one – one that cannot fail, whereas with ten, you can afford to have a few of them be a bit duff. The podcast James Altucher/Adam Grant: How to turn your next idea into a (successful) business talks about this (about 28 minutes in) – but do listen to the whole thing, there’s advice on procrastination, creativity, ideas, sharing of ideas, testing ideas, entrepreneurship and a whole lot more that’s of direct relevance to the course (in fact a learner and I talked about and dissected this podcast in course comments). There’s also Become an Idea Machine which helps to get you in the right frame of mind for creating 10 ideas a day. What was really great to see was that learners were coming up with ideas and insights, testing them out on each other, adding to them, critiquing them and encouraging other learners. A lot of really interesting things were mentioned in comments – they’re extracted out here so they’re easier to find and to allow people not on the course to get them. How to be the luckiest guy on the planet in four easy steps – I think this is the earliest point where James Altucher surfaces the ‘daily practice’, do four things every day; something physical, something emotional, something mental and something spiritual. It works. Someone was asking about getting started with App development, so I suggested bitfountain which is an online training company for iOS and Swift. I’ve bought courses from them in the past and they’re pretty good. Originals: How Non-Conformists Move the World: Adam Grant, Sheryl Sandberg – not read this one, but it’s the book James and Adam were talking about in their podcast. It was also recommended to me by the same learner who dissected the podcast. One step on the course recommended some TED and other videos for the learners, amongst them: Sir Ken Robinson: Do schools kill creativity?, Dan Pink: The puzzle of motivation, Susan Cain: The power of introverts (this one was well liked by learners) . Two I really like are Amy Cuddy: Your body language shapes who you are and John Cleese on Creativity – YouTube – this is only about 10 minutes long, but is packed with hints and tips on how to be creative. Recommended by a learner on the course, Philosophers’ notes: The Books is a service that distills optimal living books into very well designed PDFs and 20 minute MP3’s – I’ve not tried it out yet, but think I will as it seems to be similar to something I’m using called Blinkist, but the Philosophers notes PDFs look more information-dense. Finally, I recommended Scott Adams’ How to Fail at Almost Everything and Still Win Big as it’s a fascinating book that pitches ‘systems’ vs ‘goals’. His proposal is that you will find most successful people follow systems, not goals and when you do hear of a goal orientated person succeeding in a big way, it makes the news, which makes an interesting story. It’s got a big section on persuasion as well – a skill all entrepreneurs need! We’re into week three now, which is all about how ideas develop into opportunities, so better put a bigger thinking cap on! This week the Enterprise Shed: Making Ideas Happen MOOC kicked off. It’s run by Newcastle University, and last year I joined the course as a participant. This year, I’m a mentor for ShedTech: Technology and Engineering and as I’m located in Tasmania, I’m mostly online when it’s late evening in the UK. There are six other mentors in other areas of interest; ShedArts: Arts Crafts and Culture, ShedBusiness: Business, Sheducation: Education, ShedEnvironment: Environment, ShedHealth: Health and Wellbeing, ShedSocial: Social and Community, as well as the lead Sheducator, Katie Wray and Nuala Davis who is coordinating the behind the scenes activity. My role is mainly to welcome people and encourage them to talk about their ideas and how they might make them a reality. That means how they may better describe and modify their idea, come up with further ideas, share them with others and help to identify people who will help them to take the idea further. Note: some of the links are on the Futurelearn platform and you need to be logged in to see the content. The course is free and you’ll be able to join until about the 10th of March. Over the last week, I’ve made about 80 comments to people, ranging from quick “Hi x and welcome” to longer comments about jobs, education, idea generation, technology, and general encouragement. Some of those posts started to reference each other and include links, so I thought it might be handy to bring them out here. A common comment was what happens if someone steals my idea?. A podcast (6 minutes) goes into just this “What to do if someone steals your website” and James Altucher says “No one can compete with you being you. If you have the passion and the enthusiasm for your business, then they’ll never be able to beat you”. You’re in luck – this is probably the best time for people like you who want to move onto doing something else, the flexibility of Internet tools makes it far easier to do that now than previously. There are many options; firstly – do this course :), you’ll find many like minded people here, so do respond in comments and follow those who interest you, secondly – there are groups such as the ChooseYourself Facebook group that are populated by people who are looking to create their own career and (as the name says) not waiting for someone else to ‘Choose Them’ for the new job, the promotion or whatever – they are doing it themselves. I’m in that group and it’s very rewarding, thirdly – absorb some of the flood of information out there on these topics – I gave a list of podcasts on another (FutureLearn) thread , but I’d also recommend things from Tim Ferriss (4 hour work week) as he’s very practical too. Finally, anything by Seth Godin is worth reading – he recognises the world of work has changed dramatically and is on a mission to help others realise that. ….I’d recommend almost all James Altucher’s podcasts – he’s a serial entrepreneur, shares his ideas, is very contrarian, has an easy writing style and has a good sense of humour too. His most recent podcast series is with Stephen Dubner (Freakonomics) called ‘Question of the Day‘ (usually less than 20mins) – lots of business and entrepreneur-related stuff there. My favourite though is “Ask Altucher“, usually less than 20 minutes, one a single topic. Sadly, not updated anymore, but a wealth! of good advice there. Other people were asking about how to find audiences etc. and to them I’ve been suggesting they use Facebook ads as a simple and inexpensive way to find out who is out there, and whether a market exists for the product or service. My post from last year has some details of how you might use Facebook for that purpose. There were people questioning the current educational model, and to them I suggested Seth Godin, James Altucher and Peter Thiel (I should also have added Peter Diamandis). General Links to podcasts, books, apps etc. I sifted through the comments I made and extracted out some of the links I talked about, I’ve added a few more in here for completeness. Hope this helps! Don’t forget that all these people have blogs, podcasts, twitter accounts etc where a lot of their thoughts are available for free. Kevin Kelly – a thousand true fans – talks about 1000 fans being enough for an income, and also that better technology is the answer to poor or no technology. Claudia Azula Altucher – Become an idea machine – delightful book that helps you get into the habit of writing down 10 ideas a day, essential to exercise your ‘brain muscle’ and help you get better at writing and developing ideas. Seth Godin – updated almost every day with pithy commentary on doing your work. Seth has written a lot of very good books; I’d say, based on what I’ve read of comments on the course so far, the ones of most relevance are probably Linchpin, Your Turn, The Dip and Tribes, but honestly, all his work is well worth reading. James Altucher – I came across James’ work by accident and have devoured most of what he’s written since then. His book Choose Yourself helped me when I was deciding to change my own career and it’s so popular it has a Facebook group as well – the group is closed, but you just need to request access. James also got me into listening to Podcasts (I use Overcast – it’s got some good features). Tim Ferriss does some superb, in-depth (1hr+) podcasts with some very interesting people. He recently talked to Seth Godin, which was exceptional. Tim does detiled show notes, with links and cues into specific places in the podcast – highly recommended. Peter Diamandis is perhaps best-known for being the originator of the X-PRIZE which was initially known for putting private space exploits on the map, but which has now expanded into many different areas. He also co-authored Bold and Abundance, two books that budding entrepreneurs should really know about. He co-hosts an excellent podcast at Exponential Wisdom where the topics (usually about 20 minutes) range from innovation to robotics to AI to disruption to education. Highly recommended. Stephen Pressfield’s The War of Art, is an exceptional book centred around the defeating of “Resistance”, the internal, eternal voice that is always knocking us. Seth Godin refers to a similar thing, calling it the Lizard Brain, and this video on “Quieting the Lizard Brain” is well worth watching. I’d also highly recommend watching social psychologist Amy Cuddy’s TED talk Your body language shapes who you are, which is a superb presentation on the science of “faking it till you’re making it” and would be very helpful for people who might be lacking in confidence. It’s been a really interesting and rewarding time and I’m looking forward to more of the same next week! Well, the ‘vacuum tube’ in the article is an exceptionally pretty chip, and there’s lasers involved and trapped ions too – and it’s still in the research phase, but it’s called a ‘quantum vacuum tube’. The Enterprise Shed: Making Ideas Happen MOOC starts today, and I’m very happy to be a mentor in the ShedTech area. I took the course last year (I wrote a few posts about it below) and got a lot out of it. I provided some feedback to the team and they asked me to be a mentor this year. So last week we were asked to comment on assignments where course participants provided a problem and then their solution to that problem. If a business could be made out of, all the better, but the main drive was for people to describe a problem and what their solution to it might be. Some of the problems submitted were around social issues, so it’s wasn’t all ‘for money’ business. How clearly is the problem and solution articulated, no criticism of the validity of the idea, rather how well you understand what has been presented. There was no real word limit so I contributed what I felt comfortable with, I think the average was around 300-400 words, but there were a few that were way over that. I did my first feedback and then found that after hitting ‘Submit review’ there was the option to do another one. So I did, and another, and another. I’ve currently done 20, and may call it a day there. Or I may not, as this is a MOOC, I don’t think that the course will ‘close’ as such, so I may be able to come back and comment further. Is there a market for your idea? Set up a webpage offering the service (cleaning, personal trainer, custom knitting etc.) along with some indication of what you might charge. Then buy some adverts on Facebook which are explicitly tailored to your target audience (e.g. people in their 30’s who are into fitness, who are in your area who have recently visited websites about personal trainers). If you get a response on your site, you know there’s a market, if you don’t, modify your offering until you find there is, or try something new. Or maybe try Google adverts instead. Where do I find like minded people? Join or create a group on Facebook, LinkedIn or other social networks in your area or country. Be active on those networks, offer advice and ideas freely, turn up at local get-togethers and webinars. Pretty soon, you’ll have a group of people who are interested in what you have to say. Or maybe you’ll find you’re not into that anyhow and you’ll do something else. Very few people were held up on wanting money before they could do anything. This was very encouraging – most people who were stuck on getting started were there because they weren’t sure of the next step (but they knew they wanted to make that next step), or because they weren’t sure that their idea had any merit to begin with. For the former, I suggested tiny steps, and in the case of the latter I tried to offer some thoughts on how they could size up the market for their idea or service beforehand. Some of the ideas were outstanding – I’ll not give anything away, but I was able to comment on some ideas that I really hope come to fruition – I would love to buy some of those products and services! Some problems were heartbreaking and I really hope I helped those people out somewhat. Some people wanted to solve problems that were huge – electrifying a country for example, and for those people all I could do was to offer some advice on finding like minded people. I have been reading “Become an Idea Machine” by Claudia Azula Altucher and following the ‘Daily Practice’ regimen that she and James Altucher talk about a lot – each day you do something; physical (yoga, walk 10,000 steps, dance), mental (write down 10 ideas, play a brain-training game, learn a language), emotional (don’t deal with people who are downers, get closer to people who are good for you) and spiritual (not necessarily religious; being grateful for what you have, forgiving people). Do I do this each and every day, nope, but I’m trying to get that little bit better. What I’ve been trying to do with providing feedback to other participants on the course is to give them 10 ideas that might contribute or build on their solution – I’ve not been entirely successful with all the responses (so if you got a response from me and it only had three ideas – I apologise! ), but it has helped me a lot – my brain has been frazzled the last few days (in a good way). The MOOC so far has been really interesting and I hope my contributions are helping people out. I’ll post some more as things progress. I’ve started doing the Enterprise Shed: Making Ideas Happen MOOC at FutureLearn. I’m in the happy position of knowing some of the people who are involved in creating and running the course, in particular Katie Wray and Suzanne Hardy. The course started on Monday 30th March, so things are just getting up to speed – this also means there’s plenty of time for you to get involved! Becoming an Idea Machine is at the core of the Choose Yourself philosophy/movement/lifestyle? that I’m working on. To be specific, it’s one of the four legs of the stool, but more on that later. An added bonus is that I also get to connect up with some people I know from Newcastle again, which is always good! So far I’ve been introducing myself and making comments on some initial posts – there are a lot of people on the course already and a great amount of interaction. People are currently finding their feet and talking about what they want out of the course, so you’re seeing people that want to make connections, float an idea, keeping the brain oiled, up their MOOC count, get some form of funding/support for an idea and its also clear that some people want the course to pull them out of a rut. So, a lot of different perspectives there. It should be fun – the people involved in building the MOOC are sincere, exceptional and committed, and I know they’ve been working really hard on this, and I wish them well! I’ll post more as things progress. I see that Parliament has been dissolved and there’s a General Election looming in the UK. Because of amygdala function and media competition, our airwaves are full of prophets of doom. Because of the negativity bias and the authority bias—our tendency to trust authority figures—we’re inclined to believe them. And because of our local and linear brains—of which Dunbar’s number is but one example—we treat those authority figures as friends, which triggers the in-group bias (a tendency to give preferential treatment to those people we believe in our own group) and makes us trust them even more. This was a great session, Kevin Kelly is full of ideas and he and James really hit it off. Kevin has been many things, including the editor of Wired and the Whole Earth Review, a driving force behind the Cool Tools site and as a drop-out spent a lot of time in Asia travelling. To say he’s a ‘techno-guru’ or ‘editor’ or ‘evangelist’ is very limiting, so check out his own ‘about-me’ for the full story. He’s well known for the phrase “A Thousand True Fans“, the idea being that if you have 1000 people who will absorb all your work (be it music, writing, comic books, films, seminars, software or indeed anything tangible or intangible), and if they spend about $100/year on your products, then you have a cohort of followers who then allow you to have a reasonable income, i.e. you have a business. This can happen because the ‘gatekeepers’ are no longer as powerful as they were so therefore you don’t have to ask permission to start or create something (it’s easy to self publish on Amazon or iBooks for example). This means that anyone can make content, and it also means everyone can make content – so how do you keep up with all of this content. James gives an idea of how things have scaled in terms of books being published; 500,000 ISBNs were issued in 2009 and 15,000,000 ISBNs in 2014. There was talk of 6 billion songs a year being released in the late 2020’s if current trends continued. The argument put forward is that this does mean there is a role for intermediates to in some way curate or guide people through the huge number of options that people have. If you want an audience for your creation, you need to make something of value – creating something from nothing that people find valuable to them. Kevin then says that he thinks the reason he has a contract from Penguin for a new book is that he has his ‘fans’ ready to consume the book and in effect he is bringing his own audience with him – book publishers don’t have an audience. I know some publishers who would definitely agree with this. But how do you get “a thousand true fans”? – essentially by providing them with a service or experience that they value. Kevin also talked about the early days connecting to bulletin boards that could handle maybe 100 people at a time (this was when each connection to the board was a real modem – hence the limit on the number of users – and the output was green flickering text), but even then the potential of these machines that were connecting people was clear to see to him. My first encounter with online services was with the Prestel system back from about 1980 onwards and I can remember putting the phone handset into the acoustic coupler and warning everyone in the house to not make phone calls – sometimes they even listened. But I missed the 90’s internet boom? Kevin is very bullish on AI. The idea here is that you will be able to take any service ‘X’ and add AI to it, buying AI in the same way as Amazon Web Services work today. This then cognifies the service and makes it more useful to people. An analogy was made with electrifying services (vacuum cleaners became electric vacuum cleaners, motors became electrified and so on). Once I heard this quote, I tried to think of an example of something that is working that is still called AI – couldn’t do it; self-driving cars, facial recognition, fast-trading software, robot vision, computer chess – none of it is really called AI any more. Kevin: Most of the problems we have on the planet today are from our previous technology and most problems that will occur in the future will be from technologies we will create. Kevin’s opinion is that the answer to a bad technology is not no technology, but better technology. The analogy with technology is thinking made concrete: “if I were to spout out bad ideas, you wouldn’t say ‘hey, think less’, the proper response to a bad idea is always a better idea, not less thinking”. This makes perfect sense to me, and when you realise how many technologies are reaching the ‘knee’ of the exponential growth curve (the subject of a later post), it’s clear things are going to get much better. This was a surprise to me, apparently Kevin has done research that shows that all technologies that were made in the past are still being made today. Or at least whenever (who did the asking?) picked any technology, he could point out where it was still being made somewhere on the planet; core memories (as used in Apollo) in Bulgaria, punched cards in the US and apparently more people are knapping now than ever before. I find it very hard to believe this is the case for all technologies, but apparently it’s true. Towards the end of the podcast Kevin talks about his new 464-page graphic novel “The Silver Cord” – a fan-financed book which blends millions of species of angels, sentient robots and huge quantities of artwork. I’ve not read it, but James said he was blown away by it, so there’s a recommendation. I’ve been listening to a lot of podcasts recently, and want to capture the ones that influence me. The world is changing incredibly quickly now and the rate of that change is increasing – so we’re accelerating towards something – an attractor, the singularity, armageddon? Who knows, but I do know that a lot of things people have considered immutable have changed; a job for life, automation won’t effect me, my pension is safe, a house is a safe investment, a university education will set me up for life – all these ‘facts’ have been shown to be anything but. Things are going to get very interesting from here on in. I’m actually very optimistic about where things are going to go though. Have you seen Futurama? The first episode when Fry is defrosted in the year 3000? There’s a guy there that says (in a great booming, melodramatic voice) “Welcome to the World of Tomorrow!”. Yup – that.